Almanac Beer Co.'s new brewery and taproom in Alameda. With no brewery for six years, Almanac Beer Co. still managed to draw legions of fans and wide critical acclaim. For its entire existence, the Bay Area brewery made its tart, barrel-aged beers using other breweries — a temporary boon for owners Damian Fagan and Jesse Friedman, who didn’t have to invest in expensive equipment right away. That all changes today. Almanac has just unveiled its first brewery, located at 651B West Tower Ave. on Alameda’s naval base next to Admiral Maltings. 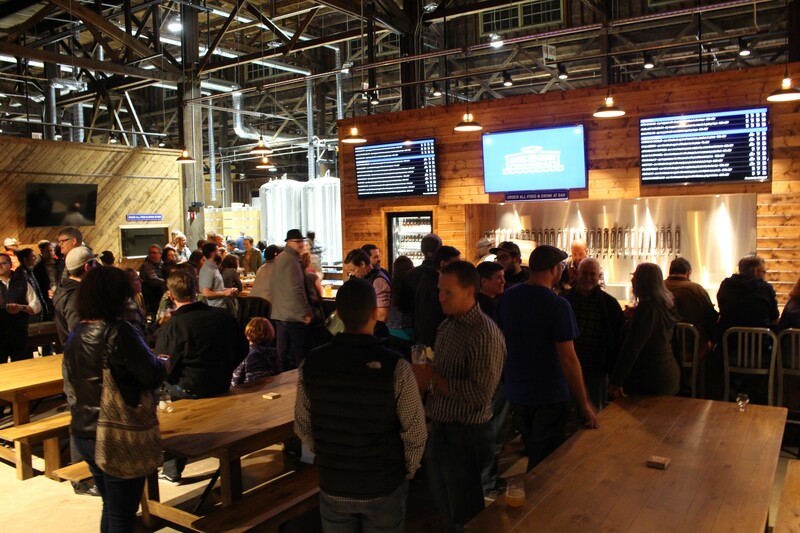 The sprawling, 30,000-square-foot brewery also includes a spacious taproom with 30 handles, though only 13 were live at a preview event Thursday night. In addition to a bangin’ sound system, the taproom features a beautiful redwood bar and full kitchen. Plans for the food program are still in the works, but there will be food trucks parked outside in the meantime. Current beers on tap include a nectarine cobbler sour, a hibiscus ginger lime sour, and a farmhouse ale suffused with pineapple, lemongrass, and passionfruit. While Almanac has built its reputation on such barrel-aged sours and farmhouse ales, Friedman said he’s excited to brew more IPAs, lagers, and pilsners at the new site. In the past, Friedman said sometimes brewing choices were made based on Almanac’s roving structure. The new facility allows for more flexibility, including “smaller batches and more experimental brews just for the taproom.” Yep, more experimental than hibiscus ginger lime. Almanac Beer Co. is open Wed.-Sat. noon-8 p.m., Sun. noon-6 p.m.